Provide comfort for the family of Selma Grover with a meaningful gesture of sympathy. 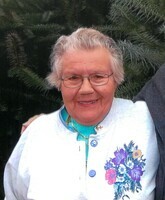 The Colony, TX- Selma (Sichau) Grover, wife of Donald G. Grover, passed away on April 12, 2019 at home surrounded by her loving family. Selma was born in Germany on May 18, 1932, daughter to the late Adolf and Martha (Bendlin) Sichau. Selma immigrated to the U.S. in 1953. She enjoyed knitting, gardening, and many crafts, but most of all she enjoyed spending time with her family. After retirement Selma and Don traveled extensively in their RV. Selma is survived by her husband of 64 years Donald, and her sons, Sam (Debbie), David; her daughter Sylvia (Patrick) Belanger; her 5 grandchildren; her 9 great grandchildren; her sister, Meta Mueller; and several nieces and nephews. In addition to her parents, Selma was predeceased by her sister Elsa Hanusch and her brother, Ewald Sichau. A Funeral Service will be held at 11am on Saturday, April 20, 2019 at St. Paul’s Lutheran Church, 837 Charles St, Torrington, CT. A calling hour will be held prior to the service at the church starting at 10am. Burial will follow in Hillside Cemetery, Torrington. To send an expression of sympathy to the family, kindly visit www.rowefuneralhome.net. To send flowers in memory of Selma S. Grover, please visit our Heartfelt Sympathies Store. Provide comfort for the family of Selma S. Grover by sending flowers.